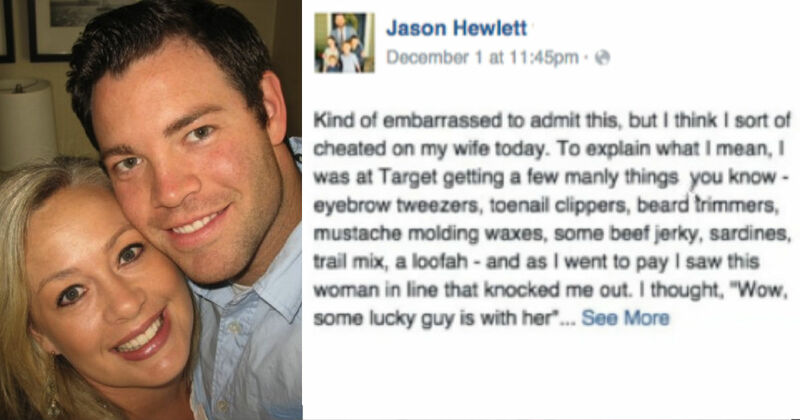 What He Has To Say About Cheating On His Wife At Target Is Surprising! 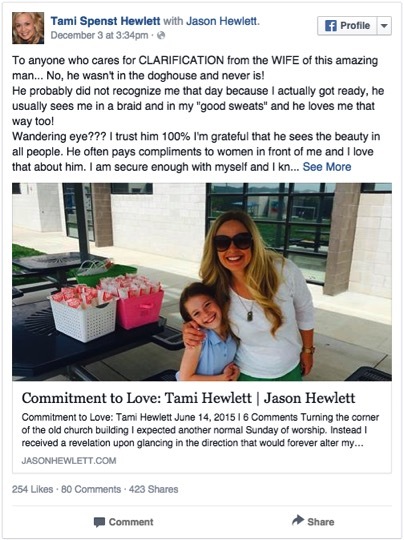 Jason Hewlett is a very blessed man. He has a gorgeous wife and 4 lovely children. And that’s why the reason he’s captured the attention of the internet might surprise you. It’s for cheating on his wife. In Matthew 5:28 it says that a man who looks at a woman with lustful intent has already committed adultery in his heart. So, Jason knew he’d messed up when he was “knocked out” by a woman a few feet ahead of him in the checkout line at Target. But before you get ready to read him the riot act, you may want to hear the whole story. See what Jason had to say about it in his Facebook post that is going viral. 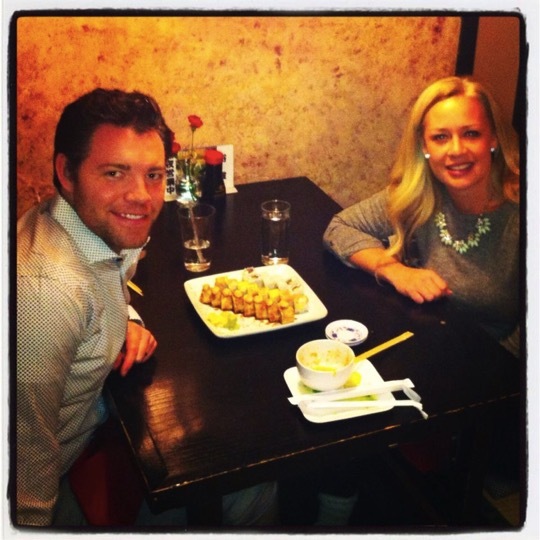 . .
Kind of embarrassed to admit this, but I think I sort of cheated on my wife today. To explain what I mean, I was at Target getting a few manly things, you know - eyebrow tweezers, toenail clippers, beard trimmers, mustache molding waxes, some beef jerky, sardines, trail mix, a loofah - and as I went to pay I saw this woman in line that knocked me out. 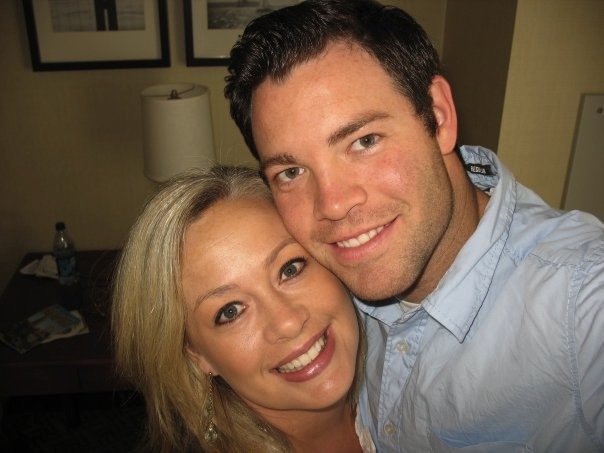 I thought, "Wow, some lucky guy is with her", and in a split second I realized it was my wife! You know, it was just out of context to see my spouse at the same store, in the same line, living her life and not knowing she might be at the same place, same time, different car. There was a person between us, so I just watched my cute little Love, tried to text her stuff like, "Hey Hottie" and "What are you buying now my Babelicious? ", none of which got her attention as she was looking for a coupon she'd saved just for this purchase. 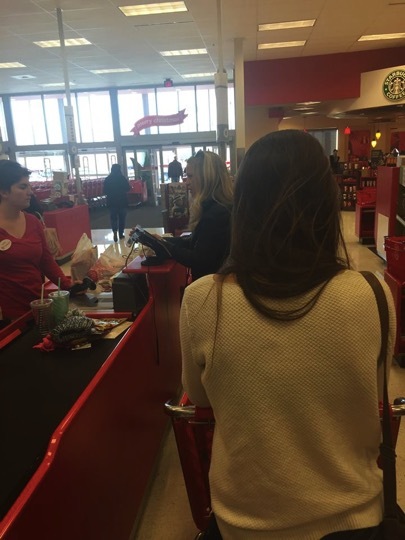 So I gave up getting her attention, as you can imagine I easily could have humiliated her by leaping on the register as a Raptor and really making her publicly proud, and instead just stood back and silently observed my feelings about this woman. First off, I was taken aback by how amazingly beautiful she is once again. I believe I see it often, but today, not knowing she was at the store, I saw her with new eyes and just couldn't believe I get to be her fella. It made me blush - but no one could see it under my huge monster Movember beard. Second, it amazed me that she didn't notice me in the slightest. This is both a good and a bad thing. Good in that she doesn't have a wandering eye. Good in that she didn't see the creepy dude with the overgrown mink on his face peering over her shoulder. But maybe that's bad, too, like what if it hadn't been me? I need to get her another can of mace just in case. But it was also bad because I realized how close I came to not ever winning her love in the first place, and the herculean efforts I had to make all those years ago to even get her attention just to say yes to one date! For a minute I felt that familiar grief of doom when I first saw her and knew well, that's impossible. But somehow I nabbed her despite my insecurities, inabilities, and imperfections. Third, I was ultimately so pleased to see her in complete confidence on this day, as the independent, capable, humble, fun, sweet, kind, awesome person she is. And then she grabbed her things and walked out the door. I never said anything, didn't flag her down, just watched her walk away, admiringly, knowing she's my wife and I love everything about this woman. She rarely looks at Facebook so she won't see this post, she won't realize she was kind of cheated on today, but I thought I'd share with you all since I'm just a dweeby guy making my way through life, and at the same time sure there are those who have had the same experiences regarding their loved ones in one way or another, and these moments are perfect. Lesson of the Day: It's good to look at those we love with fresh eyes whenever we can to remind us how lucky we are to have their light in our lives. 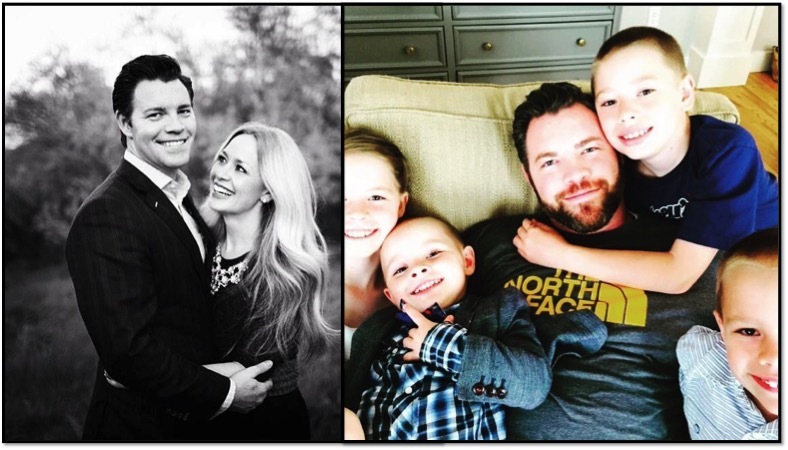 Jason’s beautifully candid post about the love of his wife soon went viral, with likes and messages pouring in! 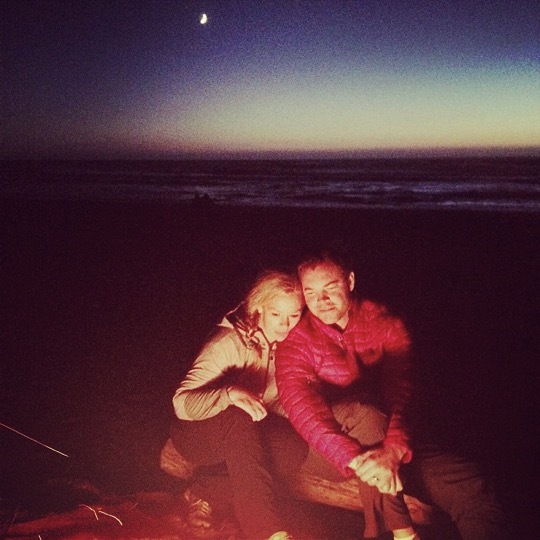 And despite saying his wife wouldn’t see his post, she did and replied with a sweet post of her own. “Thank you for all of the comments good, bad, funny and sad I'm so happy that his little story sparked some exchange of love and appreciation! Let's Love and appreciate each other a little more! That makes for a good marriage or any relationship... love, appreciation ,trust,and selfless service .... That is what works for us!